Our initial meeting is focused on getting to know you and your family. We spend time discussing how you envision experiencing and enjoying your outdoor space. In addition, we’ll review some different styles of residential landscape design and materials. We’ll share ideas for pergolas and fire pits, as well as decks and garden features. If you’re considering a new design for your commercial space, we also offer commercial landscape design services. Offer your guests a serene backyard with a cozy gazebo, complete with an old-fashioned gravel path and beautiful perennials lining the way. Or, have us design a modern patio with an amazing outdoor barbecue station and brick walkways. Once our lead landscape designer has a good sense of how we can help you realize your goals and you’re comfortable with our process, we’ll put our creativity to work and submit a custom landscape design proposal for your approval. Once commissioned to create and build your landscape designs, we get right to work. A member of our team will choose plantings, take photos, and determine measurements, as well as other information necessary to begin work on your back yard or commercial property. We practice a collaborative method of design where every project, depending on size and scope, will be worked on and reviewed by members of our team of landscape designers, landscape architects, and engineers. All work is directed by your project’s lead designer who met with you initially and is the most knowledgeable about you and your needs. Your landscape designer returns with the completed plan so you can fully envision the whole project. You’ll see how the walkways offer your space usability, as well as pleasing visual design amongst water features, energy-efficient lighting, and new irrigation equipment. 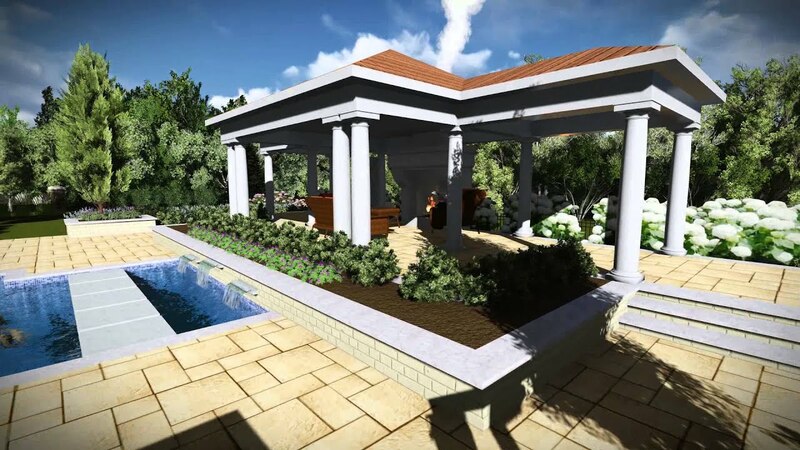 Depending on the options you chose in your landscape design agreement, our presentation may include a combination of landscape design plan view drawings, hand drawn sketches and 3D computer renderings. Your landscape designer will make sure that you have a firm understanding of how the finished product will look and the process we’ll use to achieve it. Revisions will be made as needed as per your landscape design agreement, followed by an installation proposal. If needed, we’ll make recommendations for phased installation for complex features like pools, masonry, and new fencing. Now the real excitement begins! Our uniformed profession installers will work quickly and efficiently to make your dream a reality. Our designers and site supervisors will make sure you understand every phase of the action and coordinate as needed with any third party tradesmen. The true advantage of working with a landscape design build firm like ours is that we take ownership of our projects from beginning to end. That means solid construction practices and plant selections are built into the design from the very beginning.